The meaning of the term "barbecue" changes from one part of the country to another. 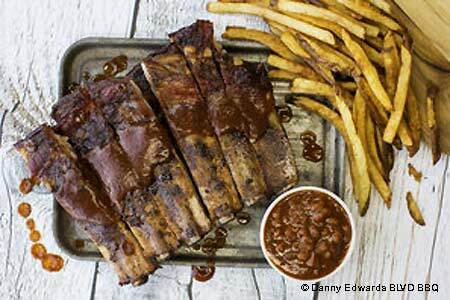 From Texas to Kansas City and across the Southeast, barbecue means well-seasoned meat cooked "low and slow" over wood until it develops a pink "smoke ring." Memphis barbecue is especially known for its rubs. Texas prefers beef for barbecue, and pork is the basis of barbecue in the Southeast. Sauces and sides vary widely, too. Whatever your pleasure, try one of GAYOT's Top Barbecue Restaurants in Kansas City, presented in alphabetical order. Find and learn all about barbecue with GAYOT's Guide to BBQ.